ENGLAND CALL-UP -- for young Notts CCC wicketkeeper Tom Moores. One of Nottinghamshire CCC’s brightest young prospects has been given the chance to train with the England senior team during their winter tour to the United Arab Emirates (UAE). Tom Moores, who is the 19-year-old son of Trent Bridge coach Peter Moores, was invited to join Alastair Cook, Joe Root and co for a wicketkeeping session with coach and Notts legend Bruce French. Now he says the experience has increased his hunger to succeed with both club and country. The Notts Academy teenager received the invitation while he was in the UAE with the England U19s’ team. He revealed that knowing every England player had once been a teenage pretender too is what helped him calm the nerves. “It was an unbelievable experience,” Moores said. “I was quite nervous before we got into it, but I decided to just throw myself into it. “All the guys had been in my position before, so thinking about that helped me and made it a bit easier. “Obviously they are a long way ahead of me. They do everything that I do, but they do it more quickly and with more consistency. An U19s’ World Cup in Bangladesh is on the horizon in the New Year for Moores. If selected, he would be competing for the gloves with Somerset’s Ryan Davies, but could also play as a batsman. 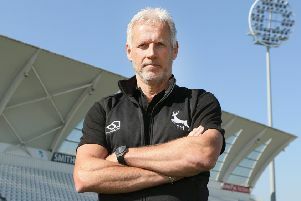 Domestically, Moores has ambitions to be the Nottinghamshire’s long-term replacement behind the stumps for the outstanding Chris Read, and he intends to learn as much as possible from his club captain in the meantime. “Ready is still going strong, so it is a case of keeping my head down, working hard and, hopefully, my chance will come,” he said. “I would take it tomorrow if it came. I feel ready now, but Ready is an unbelievable wicketkeeper. He’s great to learn from and when he decides to put the gloves down, hopefully it will be me there to pick them up. Meanwhile, Notts’s chief executive, Lisa Pursehouse, has been honoured with one of the evening’s major prizes at the Nottingham Post Women in Business Awards. Pursehouse was named businesswoman of the year in recognition of a period that saw the club attract its all-time record membership of 8,354, break its Twenty20 attendance record and deliver a successful Investec Ashes Test in which the urn was secured by England at Trent Bridge for the first time. She has been part of the senior management team at Trent Bridge since she joined the club from Yorkshire in October 2000.